Prof. Alan Deidun (back row, first from left) with representatives of the various project partners at the launch event in Palermo. 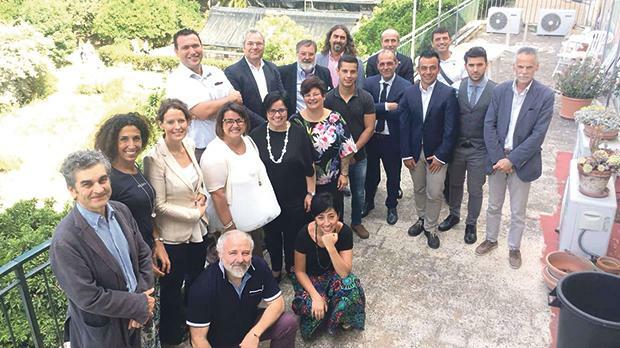 The identification of less polluting feeds for aquaculture is one of the objectives of a recently launched EU-funded project involving six partners from Sicily and Malta, including the University of Malta, the Department of Fisheries and Aquaculture, and Aquabiotech Ltd. The Biotechnologies for Human Health and Blue Growth (BYTHOS) project’s main aim is to isolate biologically active molecules (BAMs) from waste fish biomass that is normally discarded, such as collagen, for which there is high market demand. This waste fish biomass could originate from bycatch, from the processing of fish sold at markets, restaurants, shops and even from the offal of caged fish. The project also aims to develop laboratories where the processes to extract BAMs could be showcased to potential investors. The project officially kicked off in Palermo last month and runs till the end of May 2021. It is funded within the framework of the Interreg Italia-Malta 2014-2020 Operational Programme I.
Prof. Alan Deidun, an academic at the Department of Geosciences of the University of Malta’s Faculty of Science, is lead investigator for the University in the project.